You are here: Home / blog / Whole Lotta Fixin Going On! 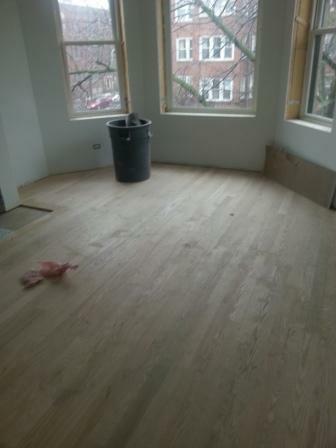 Well folks, things have moved into hyper-drive on this custom home in Andersonville. I visited this “old home to new home” project this past week and could not believe the amount of activity and the number of contractors all working at the same time. If I saw it on TV I would think it was staged! How they don’t all bump into each other I do not know, but they were all there working hard and listening to 80’s rock. I kid you not. Honestly — so much was going on I think I will have to break it into 2 posts. Hey, if it worked for the Harry Potter movies it can work for me. That my friend is a whole lot of action! So let’s take a look at the hardwood floors. As previously mentioned this is an old grey stone 2-flat in Andersonville that is in the process of becoming a new single family home. So for a lot of years it was 2 separate units, with 2 kitchens, 2 baths, 2 bedroom upstairs, 2 bedrooms downstairs, etc. 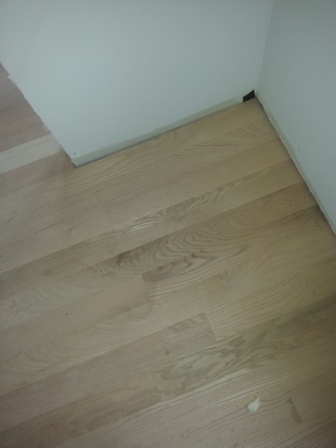 And throughout both units were hardwoods floors. 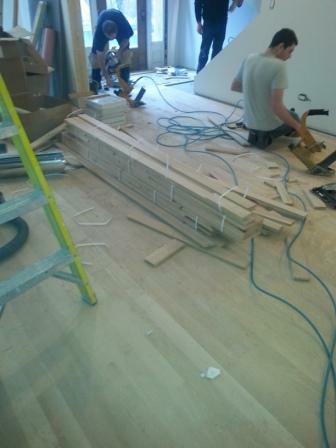 The plan was to keep those old hardwood floors. As with many things in life – it was a great idea but not so good for implementing. 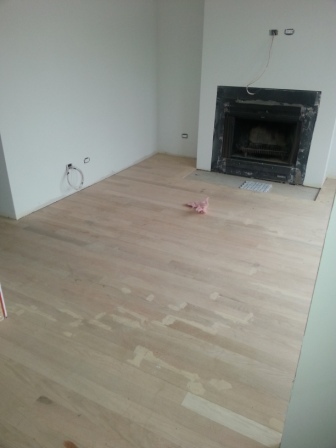 Once we got in there and started removing walls and rearranging fixtures, it became apparent; those old floors were not something we could salvage. They were too damaged and too thin. 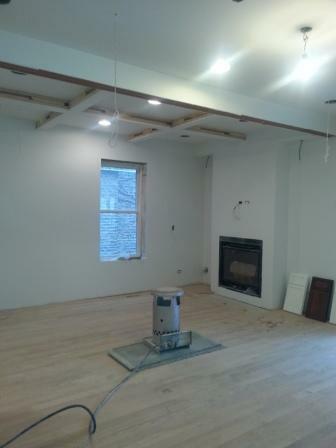 New hardwood floors throughout were ordered. Install is almost complete and they look stunning! Next up is the HVAC systems. Who knows what that is? Anyone? Anyone? The heating air conditioning and cooling systems. Again when this was 2 separate units, it had 2 separate (and really old) heating and cooling systems. Not only do you need newer, more efficient heating and cooling units, with all new walls and floors – you need all new duct work. One of the most important piece of any HVAC system is making sure it is properly balanced. Having units that are too big or too small for your home is going to cost you every month in heating and cooling bills. Make sure everything is sized accurately for maximum efficiency. Not glamorous, but every month when you pay that gas bill you will thank me for your spray foam insulation, good quality windows and efficient, properly sized HVAC units. And you are welcome. I think that is enough custom home information for this post (I know most of you are saying TMI), next up we have electricians and painters and tilers…oh my!